When I was a kid my family spent every 4th of July at my Auntie Margie and Uncle J’s house. 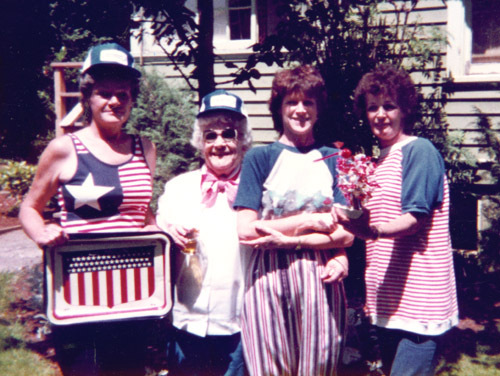 Uncle J would unfurl the American flag from the top window of their classic Craftsman house, then he’d fire up the BBQ while Auntie Margie and her two sisters prepared food in the kitchen, telling stories and chortling about life’s absurdities—especially the challenges of raising a gaggle of kids. Auntie Margie had six kids—three boys and three girls, all whom I adored. Mom had us four kids and my other sweet auntie, Katie, had a small brood herself, with three girls and a boy. We were a tight clan, especially on the 4th of July, when a blaze of cousins, and later, second cousins, would find all sorts of ways to get into mischief. If we weren’t sneaking food or running around my aunt and uncle’s one-acre property, we were throwing walnuts or crabapples at each other, lighting fireworks, starting water fights or playing Marco Polo in the swimming pool. Grandma, our no-nonsense pillar of dignity, would sit in a woven lawn chair taking it all in, trying not to chuckle at our antics, but always being betrayed by her twinkling eyes. I loved everything about our rich family 4th of July tradition, from Credence Clearwater Revival playing in the background to the photograph we took every year in which everybody lined up and said, “Cheeez” for posterity. The other thing I loved was knowing exactly where I’d be every Independence Day. It felt comfortable and predictable. The fact of the matter is that it was the only place we could be. That is if we wanted Auntie Margie to be part of the celebration. You see Auntie Margie suffered from agoraphobia. Panic attacks often involve intense fear, disorientation, rapid heartbeat, dizziness or diarrhea, and sufferers may go to great lengths to avoid situations which may trigger them. In severe cases they may become unable to leave their home or safe haven. There are a number of theories about what might cause agoraphobia, and like other mental disorders, it’s usually triggered by several factors–everything from genetics (it tends to run in families) to repeated exposure to anxiety-provoking situations to things like alcohol or cigarettes. It’s twice as common in women than men, and usually occurs between 20 and 40 years of age. Auntie Margie’s case was severe. She literally did not leave the confines of her one-acre property for more than thirty years. No, that’s not a typo. Thirty years. Before you start envisioning creepy images of Howard Hughes or some socially deranged person, you should know that Auntie Margie was the farthest thing from that. In fact you’d never know she had a mental illness. She was up on all the news, pop culture, and music. She was a voracious reader. She wore make-up, painted her fingernails, hosted fancy Valentine’s Day gatherings, had a fantastic sense of humor and was wildly creative—a painter, gardener, seamstress, craftsperson, woodworker, house designer. Most of all, she was a superb actress. She never talked about her struggles and in fact, acted as if her life was just like yours or mine. I loved Auntie Margie deeply. She was like a second mom—somebody I felt a connection to from an early age—especially after living next door to her for the first six years of my life. We laughed and talked in her kitchen, and we played games like Boggle and Uno. She French braided my hair, sewed me dresses, and let me help in her garden. I always felt special when I was with her, even if we were just shooting the breeze and eating cucumber sandwiches under the apple tree in her backyard. Auntie Margie’s agoraphobia haunted me though, especially as I got older. I wanted to get her help. I wanted to break her free of her chains. I wanted her to see the beach again. I wanted her to eat buttered popcorn with me at the movies. I wanted her to be wrapped in the magic of an art supply store. I wanted her to be able to get her hair done at a salon and have lunch with her sisters somewhere besides her kitchen. I wanted her to go for a drive in the country or breathe fresh mountain air. I wanted her to be free. So what stopped me from getting her help? My mom warned me over and over, “If you confront her about it, she’ll never speak to you again.” Mom and I argued about this more than a few times. 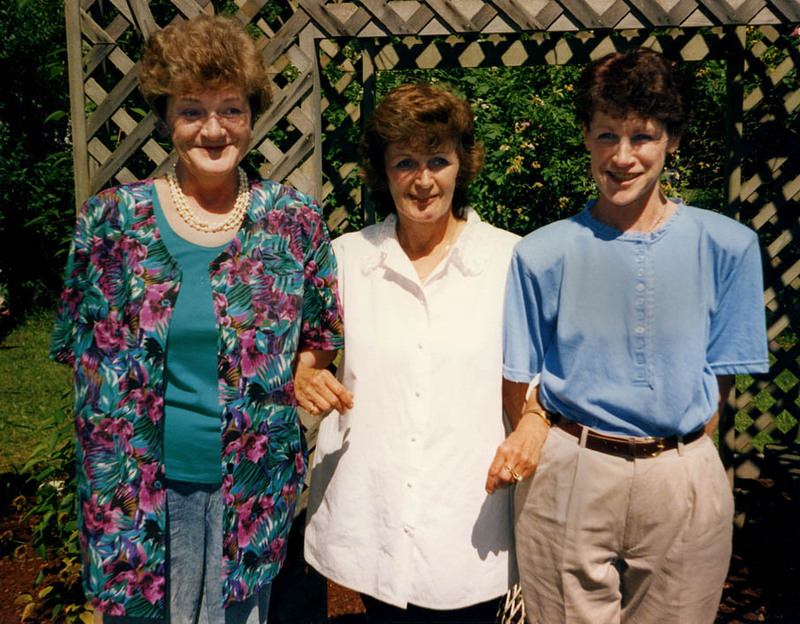 “How could we NOT get Auntie Margie help?” Mom loved her sister more than anything, but she was paralyzed by fear too. So was the entire family. Margie’s agoraphobia was the elephant in the room nobody talked about, even though everybody wanted to do something to help. Her husband, a World War II veteran, and a man of extreme honor, carried the burden of her illness for more than three decades. I will always consider him a King Among Men because most husbands never could, or would have endured what he did. It’s impossible to imagine the range of emotions he must have felt all those years, but he stuck by his wife and kids in sickness and in health, in good times and in bad. And then after thirty-two years, one day, by some miracle, Auntie Margie left the house. I thought maybe she’d won the lottery. The news she eventually spit out though, was even better—so much so I dropped the phone, whooping and hollering, doing a happy dance in my kitchen, tears of joy streaming down my cheeks. It was one of the happiest days of my life. Auntie Margie didn’t just saunter out of her house though. She had been a longtime smoker and had become seriously ill with pneumonia. Without medical help she most likely would have died. To this day I still do not know many of the details, but I do know this: because Auntie Margie was courageous enough to get in the car and ride to the doctor’s office (which I can only imagine was terrifying for her), I was brave enough to make a phone call to her doctor. This time though, I ignored Mom’s warnings and picked up the phone. My uncle had taken Auntie Margie to the family doctor I’d gone to when I was growing up. I hadn’t seen him since I was a kid and doubted he would remember me, but I didn’t care. I wanted to make sure he knew about Auntie Margie’s condition—afraid that if she or Uncle J didn’t mention it, this one chance to get her help would slip away. I never expected him to tell me anything, and in fact he didn’t need to; I could tell from our conversation that everything was going to be okay. Perhaps somebody else had called too, or maybe Uncle J or my cousins had insisted Auntie Margie get help. Or maybe Auntie Margie was finally just ready. Whatever the case, life changed dramatically after that day. In a nutshell, here’s what happened: Auntie Margie got treatment, and she and Uncle J spent the next decade and a half making up for lost time. They sold their house, which I imagine might have felt like a prison to her, bought an RV, traveled, moved to the beach, and enjoyed a much fuller life, including family celebrations in many different locations—not just their house. My guess is that my phone call had absolutely nothing to do with her recovery—zero, zip, zilch, but it gives me a tiny bit of solace knowing that after so many years of being silent I finally tried to do something, anything, for this person I adored so much. 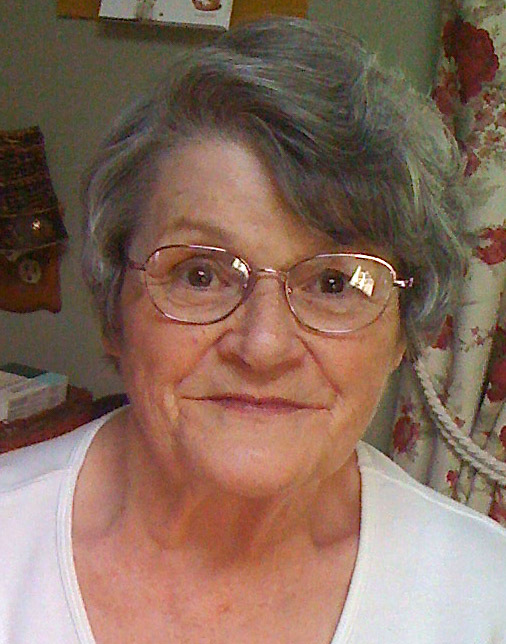 Auntie Margie passed away a few months ago at age eighty-one. Before she died I flew to see her one last time. I wanted to spend time with her—along with my uncle and cousins—and I wanted to tell her one more time what she already knew; that I loved her. What I didn’t tell her though is that I’m sorry for all those years I didn’t speak up for her, instead watching passively as she suffered through a treatable illness. I didn’t say it out loud at the time, but I made a promise that while I would always choose to celebrate the best years of Auntie Margie’s life, I would not let those other years go in vain. I would share her story so perhaps it might inspire someone else to get help or encourage family members to shed their fear and discomfort and begin talking about the elephant in the room. During this week of celebrating the 4th of July, a holiday that will always remind me of Auntie Margie, and one that appropriately honors freedom and independence, I’m telling her story. I hope it sparks a conversation and helps take the stigma away from mental illness, and I hope it let’s freedom ring for somebody else. Here’s to you, Auntie Margie. Thank you for making a beautiful difference in my life. You will always be an inspiration to me. This entry was posted in Random Musings and tagged 4th of July, agoraphobia, families, fear, freedom, Independence Day, mental illness, panic disorder, phobias by Becky Green Aaronson. Bookmark the permalink. I have to say, Margie was one of the most remarkable women I’ve ever had the pleasure of knowing. Thank you for the moving story and tribute. I agree with you whole-heartedly, Ruth. She was a remarkable woman who made a big impact on all of us. I’m glad you enjoyed this post.Thanks for letting me know. Becky, this is exactly why I talk freely about all the odd quirks I have. I have helped a couple people over the years. I have struggled with many of the same issues Mom did. Our bodies are all little chemical plants and what we put in has a huge impact. For me depression springs from trying to live like the average person. So much of what passes for food now days is toxic to me and was to Mom too. There is of course no one right answer to solve this. Her struggles really began when I was born and she suffered terribly with postpartum depression. Grama G raised me for months, probably why she and I had a particularly strong connection. Dad walked me for hours while worrying about Mom. Yes she did receive “shock” treatment in the mid-late 50′s. It was horrifying to her and did very little for her. When I was in 2nd grade she had a complete breakdown and Mike lived with L cousins and Rob and I lived with G & G S for a number of months. Yes there were some very trying times involved for everyone. But there were also so many wonderful times which in my memory overshadow all the rest. I remember a Mom who went places. A Mom who was always there for us and who made the best birthday parties and holiday celebrations around. When I was a kid all the neighborhood wanted to hang at our house. Our Mom interacted with us and let us be kids and have a great time. I’m sorry the younger siblings didn’t get to see as much of that, although I also remember wonderful times in their growing up years too. It’s just that Dad or I took them to buy their new shoes while Mom stayed home and sewed beautiful clothes and made wonderful doll houses and so many other things. Yes, watching Mom struggle with life certainly influenced my decision to not have children. I knew at a young age I had inherited much from her, both good and the not so good. Sounds like looking on from the outside was perhaps tougher than being there. And once again points out talking is a good thing. Carrie is right, we did worry about you and your family. I know Mom was aware of her differences and I also know that she had a very happy and fulfilling life in most ways. She treasured each and every one of her family and oddly enough sent us out into the world to live. She loved hearing back from us and listening to our accounts. I also know that many things happened in Mom’s life that were out of her control and did nothing to improve her mental outlook. Life. She loved the finer things in life and did what she could to create beauty around her. Of course we all had different relationships with Mom depending on our places in her life and our own personalities. My Mom was a very strong, independent and courageous woman all her life…I admire her and Dad for making the very best life they could with the resources and knowledge they had available to them. I look forward to our next get together and sharing more stories about our 3 Mom’s, the most influential women in our early years and remembering the 3 of them laughing uncontrollably over nothing and every thing! Claudia, wow, I learn so much from you! I had no idea about the early years. Not one word of that was ever passed down in our family. It all makes so much more sense. And sharing your discoveries about the connection between food sensitivities and depression–very powerful. A second it when you say, “My Mom was a very strong, independent and courageous woman all her life…I admire her and Dad for making the very best life they could with the resources and knowledge they had available to them.” So true. Thanks for sharing all this with me (and my readers)! Really enjoyed this post. Wonderful family photos, and writing about your family so honestly. I appreciate that. Thanks, Maurita. I appreciate your kind words. I’m glad I could share this story with you. Pingback: A blogger’s Journey from 1st post to the 100th… | Being Arindam..
Jenne, welcome to my blog. Thanks for taking the time to read this post and leave a comment. I appreciate your two cents, and like your idea about helping people break out of boxes and labels. In my aunt’s case, it’s hard not to classify her agoraphobia as a mental illness because it was so severe and so long-lasting, but I am by no means a psychiatrist–just a family member who loved her dearly. I see your point about not wanting to use a word like mental disorder or mental illness though, as a way to avoid unintentionally wounding somebody, but with this post, I was purely trying to express the idea that mental health is just as important as physical health, hoping to encourage people to look upon it that way, and not wait to get help if necessary. So often, even in the healthy families, and definitely in the other kind, the whole family is in collusion to maintain the armature that seems to hold the thing together, and we’re very afraid of pulling out one of the pins. I suffered sudden panic attacks for about five years, late teens, with no idea what they were or if they had a name or if anyone in the history of the world had ever had them before. I’d have done anything to avoid them. Fortunately for me, they happened any old where, including in my home, so I didn’t have to develop agoraphobia to avoid them. And I grew away from them in my own way. Strong pot was part of the problem. Alcohol was part of the solution. Well, there’s fifteen years I’ll never have back again. But all is well now. I love your telling of it. I think many families are afraid to pull out a pin and have everything fall apart, especially when on some levels the family is functioning. That’s the case in all sorts of situations–from mental health issues to addiction to… It’s easier to ignore it and hope it goes away or gets better. But in the long-run, of course, the pin has to be pulled before a family can great a beautiful new design. I’m beginning to understand from several comments and emails I’ve received that panic attacks are much more common than I ever imagined. I’m glad you figured out a way to quell them, even it if did take some time to work through them. Glad all is well now. Thanks for taking the time to swing by my blog and leave a comment. I enjoyed your recent post as well. I believe mom’s agoraphobia is something she lived with all of her life. Not talking about it was one of her ways of dealing with it. If it wasn’t discussed it didn’t really exist. Dad told me some stories of how she struggled when Claudia and Mike were just babies. The doctors tried to “help” her then with electric shock treatments and different therapies. I think they terrified mom into refusing anymore of their “help”. We are a great family for avoiding tough conversations, except for me. My nick name “mouth” was one I came by honestly. Mom and I fought for years. I never understood what stopped her from coming to my school for conferences, going with us to the grocery store, allowing me to participate in all the activities I wanted to be apart of. Her fears would reach out and try to grab me and keep me safe at home. I couldn’t wait to be free. I had the privilege of having a high school psychology teacher who actually was a very wise man. He told me my parents were not perfect, they were who they were long before I came along. I couldn’t fix them. It wasn’t my responsibility. I couldn’t give them advice, I could only listen. Then I could tell them what I heard. It took a lot of years and three children of my own to realize that we are all individuals. We come into this life with idiosyncrasy’s that are ours alone. You are so right that what mom delt with was a disease. Once she found the right person to listen to her, give her the direction and prescriptions she needed she was on her way. Quitting smoking, cold turkey, because she had been so sick was the biggest step forward. The addiction to cigarets and the chemicals contaminating her body finally lost their hold on her. Being strong enough to control the urge to smoke set off new fires. She started to paint wonderful portraits. She went out to lunch with her sisters. She moved to the beach with dad and completely enjoyed it. She went to the beauty salon and had her hair done. All of the things that we had always wished she could enjoy, she did. Life still wasn’t easy for her. She still had her demons that she lived with. I truly believe that even though we all thought she would be so much happier if she had lived her life as we thought she should, she was happy. Having her sisters, children, grandchildren and great grand child in her life made her happy. We all are affected by the struggles of the ones we love. Hold them close to you and never give up on them. We cannot make them except our help we can only offer our love and Becky you did that. Mom thought the world of you. She knew how tuff your young years had been and wished she could make them better. As you grew and took on the world she followed your life adventures. They seemed grand to her and she enjoyed them as if they were her own. Funny thing how you both wanted to help one another and did just that by being there to share your life. I can’t wait to see you and Olivia next month. Maybe we can get dad to tell his side of this life. Carrie, the beauty of an aunt-neice relationship is that it doesn’t hold any of the expectations of a mother-daughter relationship. You expected things of your mom, like every child does, and she expected things of you. Your mom and I had the luxury of enjoying each other without the weight of all that. I can’t even begin to imagine the day-to-day frustrations of living with your mom’s illness. There are so many little things we all take for granted with our mothers, and so much you and the rest of your family had to carry because she was unable to do what was traditionally expected of her. It is a testament to your strength that you’ve come to terms with it and raised your children with the appreciation of their own individuality. Lucky them to have you as their mother! And if you could see my smile right now, you’d know how touched I was to read that your mom enjoyed my little adventures around the world as if they were her own. Thanks for sharing all this. Looking forward to seeing you in August! I am sure your aunt, mother had a condition called hyperphoria. This condition caused her agoraphobia. I have a blog at agoraphobiawhat.blogspot.com that will explain this condition. I also had a aunt with agoraphobia and I also have it. After finding out I had hyperphoria this condition of agoraphobia is now gone. Becky- just made time to read your tribute to your Aunt Margie ( the same nickname my father always called my mother). What a heartwarming peice and felt like part of your big family. I come from a big one also and we all shared so much together during holidays and casual get togethers. Your Aunt Margie may have been a prisoner in her home, but she was loved and now you are helping people by telling her story. What a gift you and your family are giving to those who are suffering with agoraphobia. She must be looking down thinking to herself that she has one terrific niece. Auntie Margie always made me feel terrific, even if I didn’t do a thing. She was that kind of person. Thanks for taking the time to read her story. It makes me happy knowing others are being moved by it. You have shared the essence of your Auntie Margie so beautifully and with crystal clear description that I have fallen in love with your memory of her myself. To know that you connect her with Independence Day, and that one day she actually freed herself by having to go to the doctor, is an amazing connection for you and all your family. Yours is a poignant story which needs to be spread around the world. Unfortunately for too long mental illness has carried a horrible stigma. There are so many sufferers who look just like the rest of us but are bound tightly by an illness they can’t explain or describe. Thank you for sharing your story of Auntie Margie with us. You should really think about turning this story into a beautiful memoir in honor of your beautiful aunt. Sherrey, many thanks for your generous words. It makes me smile from the inside out that you fell in love with Auntie Margie too. She was a very special person. Hopefully her story will make a difference in somebody’s life, and encourage a more open dialogue about mental health issues. Your obvious affection for your family, and especially for Margie and her plight, are incredibly moving. It is far easier to ignore problems people do not talk about than it is to find loving ways around them, like your family did for all those years silently accommodating her. The fact that you did not speak up does not I dictate a failure in any way. It seems like you chose to embrace her the way she was, and that you were not willing to risk damaging the special relationship you had with her by confronting her. I imagine that the love and respect she had for you and the others she was close to played a large part in her eventual healing. I can only imagine the kind of joy she experienced, in a highly heightened sense; like someone blind who has super hearing powers, when she eventually broke free and began her “outside” adventures. This kind of gratitude and pure joy could only have happened just as it unfolded; oh so beautifully…a miracle to behold and remember forever. Britton, your words wrapped me in a warm blanket of gratitude. Thank your for leaving such a kind and thoughtful comment. What a great and powerful story! How sad for the 32 years she spent confined by her illness. How absolutely wonderful and uplifting that she got help and was able to dramatically change her life. Thanks, Becky, for sharing. Btw, I was a subscriber to your blog, but just realized I haven’t been receiving updates/notifications of postings. I thought maybe you weren’t blogging. Well, now I see that’s not the case. Glad I swung by. Will try to subscribe again. Monica, great to see you here again. I noticed you hadn’t been around, but figured you were busy with your own writing and busy life! Welcome back. I’m glad you happened to swing back by for this post, which as you know from reading it, is near and dear to my heart. Auntie Margie was a very special person whose life will always inspire me. Great story! How wonderful that you recognized the importance of casting away fear and listening to your gut. I’m saying your phone call made all the difference. Auntie Margie’s story (and her life) was unique. I’m glad I could share it with you. She made quite an impact on those around her. Thanks for swinging by and leaving such kind words. I had heard this story from you before, but was captivated by your wonderful storytelling once again! So many of my close women friends have confided to me that they’ve had periods in their lives when they’ve suffered from panic attacks. Having experienced severe anxiety myself, I know how debilitating it can be. Thanks for sharing this tale of growth and healing as it will no doubt give hope to the mamy who suffer from agoraphobia. Beautiful post, my friend! Thanks, Jessica. I remember sharing this story with you when you talked about your bouts with anxiety/panic attacks. I think millions of people grapple with this all the time, yet it’s hardly ever talked about. I hope Auntie Margie’s story sparks a conversation so families and friends don’t feel like it has to be hush-hush. Life is too short not to get help–especially when it’s treatable. Then I realized, because of a divorce, I am no longer a part of that fabulous family. I, too, looked forward to the afternoon at Aunt Margies house, and being a mental health professional, REALLY wanted to do something for her, but I was asked not to by your brother…my husband. I became very aware of the respect everyone felt they were extending by not talking about it….which seemed to be the Green way. She was a remarkable person and I will say in a funny way….she was a good role model for the incredibly debilitating issue. Her creativity, her graciousness, her staying up with the times….were all remarkable. I wish we could have asked her if she would have wanted a family member to address it with her. Probably not, or I think she would have asked. Cherie, what a wonderful surprise to see your comment! I’m sure that not being able to do something for Margie was excruciating for you, especially since you knew all the possibilities. As you mentioned, it is extraordinary how well she functioned in light of the strangle her illness had on her. You have to give a lot of credit to Uncle J and the kids for loving and supporting her through thick and thin–and her grandkids and sisters. If only the family’s respect for her hadn’t silenced us for so long. I will always look at Auntie Margie and her story as one of triumph. If somebody can overcome something like this, then anything is possible. Great story! It’s a reminder for all of us to be more intuitive and reach out to friends and family. People have so many walls built around them because of fear. You’re a great writer and storyteller by the way! I was all set to leave a comment re: how I was not prepared for what I thought was the ending: ‘Aunt Margie left the house.’ But of course that was a more of a beginning than an ending. You carried me through many emotions in this very moving post. The pull of nostalgia (and what July 4th evokes in me), the ache when someone we love is suffering (and we’re put in a position of helplessness re: doing something), the joy when circumstances take the bull by the horns. And to think it’s an all-American holiday that triggered this beautiful, completely from-the-heart post. I know it was a bit of a shocking jump to “Then one day Auntie Margie left the house,” but that’s how it felt in real life–dizzying and out of the blue. A surprise of the best, and most shocking kind. It’s interesting what triggers our thoughts and emotions. The 4th of July will always be an emotional trigger for me (of the best kind) because of the tight family bonds created on that holiday. Also remembering and celebrating the freedom and independence finally obtained by my auntie gives it extra special meaning. Although this is a very moving account of your endearing relationship with your aunt, there is another subtext here for possibly all of us. That is the importance of family documentation and interaction. So much I take for granted regarding our past, especially those in our extended families who played such important roles in helping to shape our own lives, attitudes, values, directions, etc..
What I feel now, as those in my own generation (brother, cousin) are no longer here to confer with, is a strong need to pool the experiences -good and bad – that gave us all so much that we have in common – both when we were all so young, but also now as we maneuver through these later years, and new generations look to us as we did/do to those who shared our familial qualities and traits and Life! So true, Rodger. 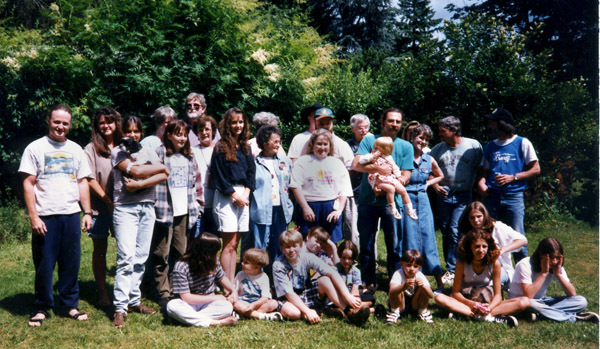 As I was flipping through all our old family pictures, I was swimming in a pool of nostalgia, remembering all the wonderful family members who are no longer with us, and recognizing the impact they made on my life, and the life’s of others in my family. One of the great joys of being a writer is being able to document pieces of history–be it family, or world events–capturing a moment in time to pass down to others. Have you thought about starting a family writing project? Thanks, Tracey. Knowing how busy you are with your writing, I’m honored that you took the time to read this long post. I’m glad you enjoyed it. Thanks for stopping by. A beautiful post, Becky. So full of love and compassion. I’m glad your aunt finally got some help. I don’t know a lot about agoraphobia, but I’m not surprised that it took years to resolve. Please don’t be hard on yourself in this. You don’t know what would have happened if you had said something to your aunt during those years–maybe nothing good. It was really a decision that your aunt had to make. And the phone call you made did make a difference, I’m sure. You gave the doctor more information. Thank you for raising awareness about the stigma of mental illness, too. You know it’s an issue dear to my heart! I’m glad you enjoyed this post, Tina. I’ve wanted to share my aunt’s story for a long time, hoping it might offer a tiny nugget of inspiration, and possibly change the way we perceive mental health, and how we act/or do not act upon it. Mental health is clearly just as important as physical health, yet I think as a society we have a long way to go in embracing that notion. Your blog is fantastic in bringing awareness about the everyday ups and downs of living with anxiety and depression. I may not always leave a comment, but I do read every post, and appreciate your honest approach in helping others by sharing your journey. What a beautiful post, with such important lessons. The only thing worse than watching a loved one suffer from an illness is watching a loved one suffer from an illness that is treatable. We need to talk about mental illness, so that people are as comfortable getting help for their mental health as they are for their physical health. Thank you for starting a conversation. Thank you, Janet. I agree that mental health is just as important as physical health. Hopefully by talking more about it, it will become an everyday conversation. Thanks for swinging by and leaving a comment. To my Dear cousin Becky . As I wipe my tears I too remember all of those wonderful 4th of July picnics. All of us cousins are bound together forever because of our three wonderful mothers! We had a fantastic childhood! Thank you for getting it right. See you in September All My Love Cousin Cindy. Cindy, some of the best memories of my childhood are from the time I spent at your house. There was such richness in all those funny, quirky moments. Lucky us, huh? And lucky us to have such great moms and aunts. Looking forward to your visit! What a beautifully written tribute to your auntie Margie. I cried with you as I read it. I don’t know anything about the sickness but I can’t help but wonder what happened that started it? Were her children all born at home? Your uncle must be a wise man to support her through three decades of house arrest. Thank you, Rosanne. Auntie Margie was somebody who made a huge difference in my life on numerous levels so it was a privilege to share her story. I do not know what triggered her agoraphobia. I was just a baby, and as I mentioned we were discouraged from ever talking about it. Her kids were not born at home, and all six were born before her illness started. I cannot say enough good things about my uncle. He is a good man. By the way, congrats on all your blog awards. I enjoyed reading your most recent post, as well as checking out all your gorgeous pictures from your trip. Fabulous! What an eerie coincidence: I’m ALSO an agoraphobic. Actually, a recovering agoraphobic. I write about it at my blog: http://darlenecraviotto.com/2012/06/14/one-small-step-for-mankind-one-giant-step-for-me/ and I even wrote a book about it, AN AGORAPHOBIC’S GUIDE TO HOLLYWOOD. You wrote a beautiful piece about your Aunt Marge, and she would have been proud of your writing. Thanks for talking about a mental illness that affects many people. The more we talk about it, the better we all become. Darlene, I just checked out your blog. Fabulous! Congratulations to you for overcoming your agoraphobia, and sharing your journey so others can be inspired. I’m going to check back and read more. I hope others hop over to your blog too. Thanks for commenting. You are welcome. I hope by sharing Auntie Margie’s story of recovery it might help somebody else. Love you too!